The Vancouver Holocaust Education Centre (VHEC) is devoted to Holocaust based anti-racism education and commemoration. The museum produces thematic onsite & online exhibitions and assembles & stewards Western Canada’s largest Holocaust museum collection, archives, survivor testimonies, library, rare books & special collections, and resource centre. The VHEC offers educational programs that accommodate unique teaching and learning requirements and schedules. 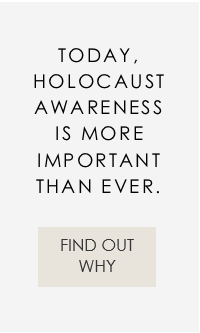 We also support educators in teaching the lessons of the Holocaust with teaching resources, training and events, and e-newsletters. The Vancouver Holocaust Education Centre presents numerous events throughout the year including commemorative programs and memorial services, book launches, film screenings, Sunday programs and conferences for teachers. We challenge youth to become committed and responsible global citizens, alert to discrimination, racism and genocide in today’s world. We strengthen the abilities of educators to teach this complicated history in age-appropriate ways. When students meet and hear survivors of the Holocaust, they become witnesses to the eyewitnesses. More students in more school districts than ever before are engaging with the VHEC. Holocaust education and remembrance are foundations for envisioning a world free of antisemitism, racism and all forms of discrimination. The VHEC introduces generations of students to the lessons of history and inspires them to value social justice and human rights. Learn more about the VHEC founders and history.